The Bosch BMX160 sensor, available from Mouser Electronics, incorporates a 16-bit digital, triaxial accelerometer; 16-bit digital, triaxial gyroscope; and triaxial geomagnetic sensor to accurately measure orientation and detect motion in nine degrees of freedom (DoF). The device offers acceleration ranges of ±2 g to ±16 g and gyroscopic range up to 2,000 degrees per second (°/s). Optimized for low offset, low noise and best temperature stability, the sensor offers an extremely low drift for accurate real-time user experience. The BMX160 sensor’s built-in power management unit and ultra-low-power background application features enable the application processor to remain in sleep mode much longer. With a typical current consumption of only 1580 μA, the sensor is ideal for always-on applications in battery-driven devices. 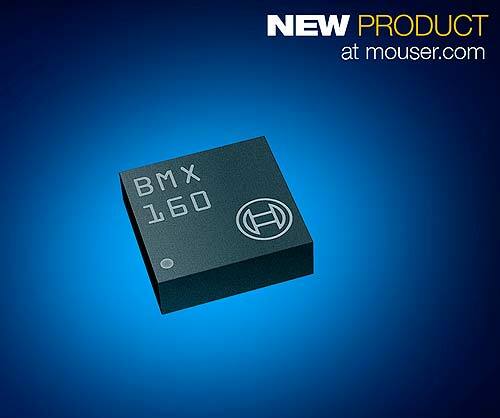 The device is pin- and register-compatible with the Bosch BMI160 inertial measurement unit (IMU), simplifying integration into existing designs, and comes factory calibrated and ready to use in a compact 2.5 × 3.0 × 0.95 mm package. For development, the BMX160 shuttle board enables designers to gain easy access to the sensor’s pins via a simple socket. And because all Bosch sensor shuttle boards have identical footprints, they can interface with the company’s other advanced development tools for optimal flexibility.